I'm increasingly being asked by friends on Facebook if it's possible to tell who has been viewing their Facebook profile. 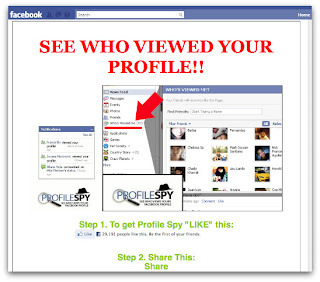 A number have been attracted to webpages and Facebook applications that claim to be able to give you a secret insight into who is spying on your profile. Well, if you're one of those people who are curious about who might be watching you online, take care. 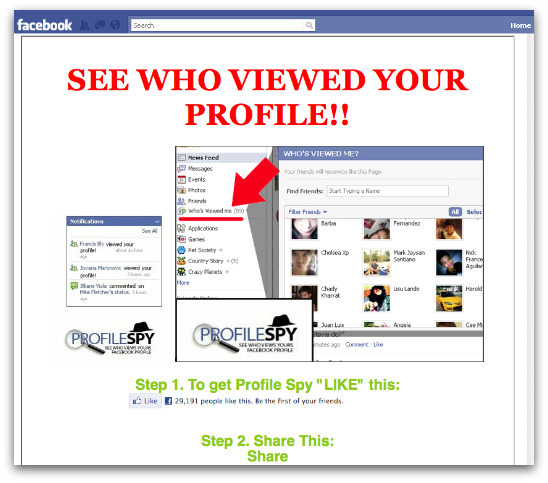 If you make the mistake of clicking on the link to one of these pages offering to tell you who is viewing your Facebook profile, you will find that the people behind the "services" want you to do a few things first. For instance, they'll ask you to "Like" their pages (which means you are spreading the link to friends in your social network), and they will ask you to advertise their site by posting an "OMG" message or set five of your friend names in a status or invite an event (with a link) to at least five different places on Facebook. They'll next ask you to hand over your personal information by taking numerous surveys - before ultimately trying to trick you into handing over your cellphone number which they'll sign up to an expensive premium rate service. Remember, this scam doesn't work as the result of click jacking, or vulnerability on Facebook. The scammers are achieving their ends because of human gullibility - pure and simple. If people considered what they were doing and thought twice about the possible consequences then we would see nothing like as many of these attacks occurring, and our news feeds on Facebook would see less spam. Interestingly, the pages that this particular scam points you to aren't on Facebook, but still display a fake Facebook header at the top. You will notice if you visit them that although the top menu options are there, they cannot be clicked on - which clearly makes the pages look even more suspect. 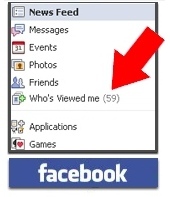 Remember, functionality does not exist in Facebook to allow you to find out who has viewed your profile. So many people are being tricked into believing that it might be possible, that Facebook has had to include a firm denial in its FAQ. Do your bit for the public good and share this page on Facebook to warn your online friends about scams like this. Press the button at the side to share this article if you're a Facebook user.